George Winter is one of Indiana's best-known artists. Born in 1809 in Portsea, England, Mr. Winter first studied art privately, and later studied at the Royal Academy. At the age of 20, Winter moved to New York City where he continued his art studies. By 1837, George Winter was located in Logansport, Indiana, and nearly all of Mr. Winter's remaining life was spent in the Wabash valley. 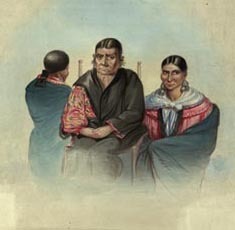 George Winter, the Catlin of Indiana, documented the forced relocation of the Potawatomi and Miami tribes of the Wabash valley through his paintings and journals. The most notable collection of George Winter's artwork and writings was donated to the Tippecanoe County Historical Association (TCHA) in 1986 by Mrs. Cable G. Ball, the widow of Winter's great grandson. This gift to the Lafayette community includes many of George Winter's personal manuscripts, letters, drawings, and paintings of this important 19th century artist. Portions of this collection are now available on-line as a joint project of the Tippecanoe County Historical Association (owner of the George Winter Collection) and Purdue Libraries, Archives and Special Collections. More than 1,200 images and pages relating to the Miami and Potawatomi tribes and their forced relocation to Kanasas have been preserved and made available to researchers through this web site. Click here to view the digital collection. The Indiana Magazine of History, Vol. 1, Number 3, Third Quarter 1905. Book Reviews for Indians and a Changing Frontier: The Art of George Winter by Sarah E. Cooke and Rachel B. Ramadhyani Provided by the Indiana Historical Society. Potawatomi history by the Citizen Potawatomi Nation.